The Weber State University Dance Program asked me to create this short video introducing their program offerings to prospective students. Dance, like other art degrees, is sometimes difficult to “sell” at the University because many students are interested in the financial outcomes of their degree. I thought the professors and students did a good job articulating how their Dance degree has helped them professionally outside of just choreography and dance. 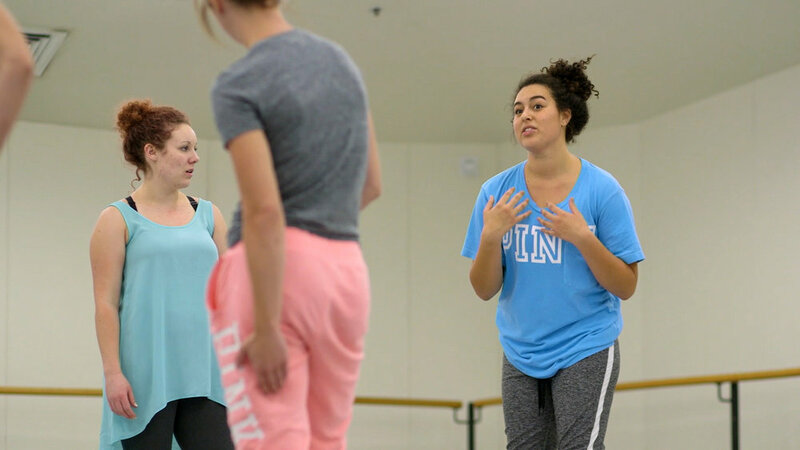 A unique element the Dance Program has introduced is collaboration with other departments at Weber State University. Dance students have teamed up with history students to choreograph performances about their interpretation of historical events and declarations. Other dance students have choreographed unique performances using percussionists from Performing Arts or the 3D artwork from Visual Arts students. Staring early in their study, dance students are able to choreograph and direct their own performances. Spring Mobile, recently asked me to create a film that documented the history and impacts of their company culture. 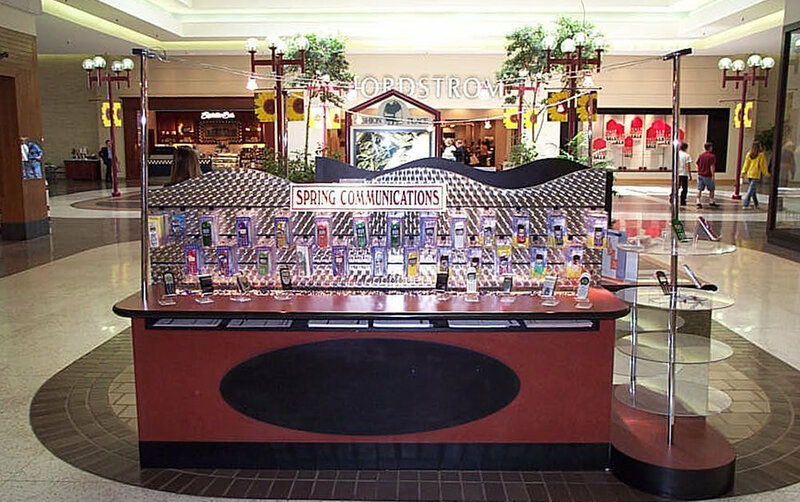 Spring is the nation’s largest wireless retailer and started in 2001 with only six mall carts in Utah and Colorado. Spring asked me to show examples of how these values have been demonstrated. During production, one value I was impressed with was “Solidarity: We create a feeling of team unity based on common goals, interests and empathy.” There were several stories of Spring employees who were helped by their co-workers because they cared about their success and well being. Below is a short clip from the film that talks about the Spring mindset of caring for their employees. I was able to spend the last few days in Rome documenting the Rome Italy Temple Dedication for the Church of Jesus Christ of Latter-day Saints Newsroom. On Saturday, Russell M. Nelson, the president of the Church, met with Pope Francis at the Vatican. 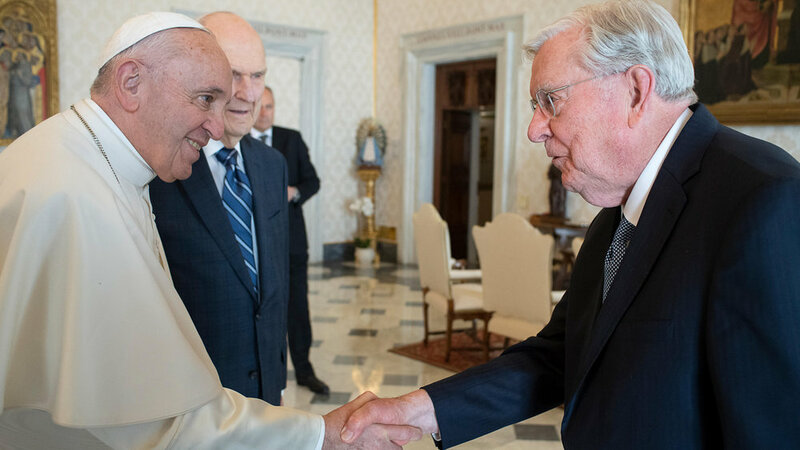 We created a short news release afterwards with comments from President Nelson and M. Russell Ballard, the President of the Quorum of the Twelve Apostles. Sunday was the Temple Dedication. The Temple and grounds were quite amazing to visit. In addition to the Temple there is a chapel, visitors center, housing for those traveling to the Temple and a good amount of green space to walk on. Monday was a unique event in which all 15 of the Church’s senior leaders had a photo taken in the visitors center. It was the first time in the Church’s history that all 15 senior leaders had gathered in location outside the United States. The backdrop was statues of Jesus Christ and his original apostles. Here are a few photographs and some of the videos I was able to help produce. 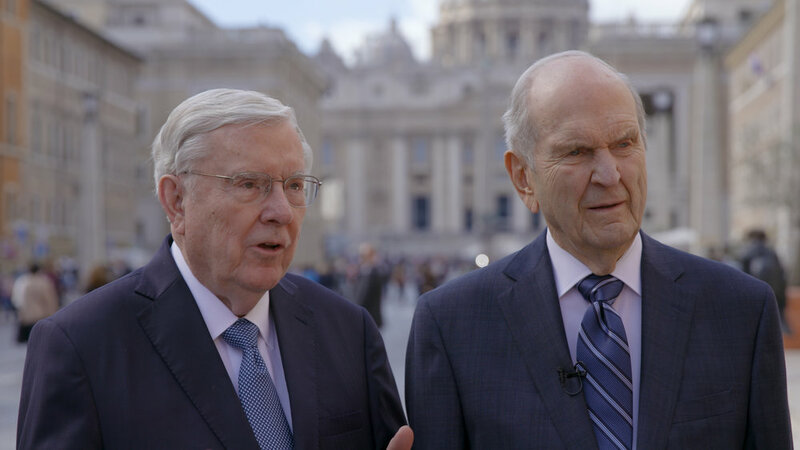 President Russell M. Nelson, and Elder M. Russell Ballard did an interview outside the Vatican after meeting with Pope Francis. Images and video courtesy Church of Jesus Christ of Latter-Saints Newsroom. 20 years ago I purchased my first digital video camera. An early film I did was about my High School Calculus teacher. Mr. Van had one rule in his classroom: don’t say the words “stupid” or “dumb.” Those who broke the rule got a chalk filled eraser thrown at them! Despite having a new digital camera to record the film, I had no computer to edit. To put the film together and add sound effects, my cousin Patrick Newey and I created a pretty remarkable editing system composed of VCRs, Walkman CD players and random Radio Shack audio and video cables. Here is a shortened cut of the film. ... oh and in case you are wondering, Mr. Van really did laugh like that... especially if you complained about too much homework. A few months later, Brent Moser and Jed Black, both students at my High School, asked me if I’d help them make a short film called “The Disco Janitors.” The film had three short scenes where 1. The Disco Janitors (played by Brent and Jed) use plungers and mops to fight off evil ninjas 2. Are attacked by free moving garbage bins and 3. Eat apples with potential girlfriends at a local diner. What was interesting about Brent and Jed is that the costumes you see them wear in the film are actually what they wore to school nearly everyday. Wigs and sunglasses included! The Disco Janitors was a lot of fun to film. If you listen closely, you can hear me laugh in every scene. This is a short segment from the film’s third scene at the diner. The last few months I helped create a new recruitment for Century 21 Everest. One part of this production I really enjoyed was learning about the beginnings of the Salt Lake City based company that has recently expanded its offices into California. George Morris, John Ciet and Rob Ockey opened Everest in 2009 at the bottom of the recession. John Ciet told me in his interview that had he not been a friend to George Morris, he would have thought George was crazy for starting a real estate business at the time. Both John and George, were emotional at times during their interviews as they told me about the first few years of the company and their struggles to hold things together and help their agents be successful. I just got back from New Mexico and Arizona where I filmed a ministry visit of Reyna I. Aburto. Sister Aburto is a counselor in the General Relief Society Presidency of the Church of Jesus Christ of Latter-day Saints. I was asked by the church’s Public Affairs department to document her trip to parts of the Navajo Nation in New Mexico and Arizona. The trip included several devotionals, home visits and trainings. Here is a short video we created, plus a few photos. Sister Aburto made a number of home visits to women living on Navajo Reservation. The Navajo Nation stretches across several states. Each location was unique in terms of its geography and development. Our filming permit let us get a few neat drone shots. The last two weeks I was able to travel to Peru, Paraguay and Chile to document the visit of Russell M. Nelson, President of the Church of Jesus Christ of Latter-day Saints. Nelson spoke at devotionals in Peru and Paraguay, which were attended by several thousand people. In Chile, he dedicated the new Concepción Temple. I helped produced video stories in each country for the church’s Public Affairs Department. Here are a few photos of the trip and videos from Lima, Peru and Concepción, Chile. In Lima, Peru, several thousand people gathered at a sports stadium to hear President Nelson speak. He gave most of his remarks in Spanish. Audience members clapped when President Nelson announced he would speak to them in Spanish. This coming year will mark the 150th anniversary of the completion of the United States’ first transcontinental railroad at Promontory, Utah. At the time, Promontory was a remote location, far from a large city. Because the junction site would need to serve as a major railroad hub where passengers would disembark one company’s railcars and board another’s, the transfer point between the Union Pacific and Central Pacific railroads was moved to Ogden, Utah. Over the next few decades no traveling passenger would cross the country by rail without stopping there. This evolution in transportation ushered in a period of remarkable growth, and the cultural diversity and commerce that endlessly streamed through Ogden’s Union Station and legendary 25th street forever changed its place in history. In 2005 I became interested in Ogden’s railroad history after visiting with volunteers at the Union Station Museum. Retired railroad workers served as patrons at the Museum and shared great stories. One individual in particular, Grant Gibson, managed a dining car and told me about a time he accompanied Eleanor Roosevelt up Ogden’s notorious 25th Street. For the next two years I produced a documentary on Ogden's railroad story and it premiered on April 25th 2007 at Peery’s Egyptian Theater. With the Promontory celebration approaching, I thought now would be a good time to make the film available online. Hope you enjoy it! At its peak, 100 trains a day would pass through the Ogden yards. Managing this constant stream of coming and going required a large workforce. 25th Street’s proximity to the train station made made it a busy destination for waiting travelers. Of all the photos I found while doing research for the documentary, this was my favorite. My friend Josh Roberts colored the original black and white image of the Union Station lobby. The last two weeks I was able to travel to Manilla, Philippines and Osaka, Japan to create stories about the visit of Elder Gary E. Stevenson and Sister Lesa Stevenson of the Church of Jesus Christ of Latter-day Saints. The stories are posted online by the Church’s Public Affairs department. The Stevensons participated in two question and answer sessions that were broadcasted live to youth ages 12-18 in Asia. Youth were able to submit questions online, that were asked to the Stevenson during the broadcast. The Japan broadcast was unique in that is was conducted in Japanese, which Elder Stevenson speaks. Here are the two stories I helped produce from Manilla and Osaka, plus a few photos from the events. 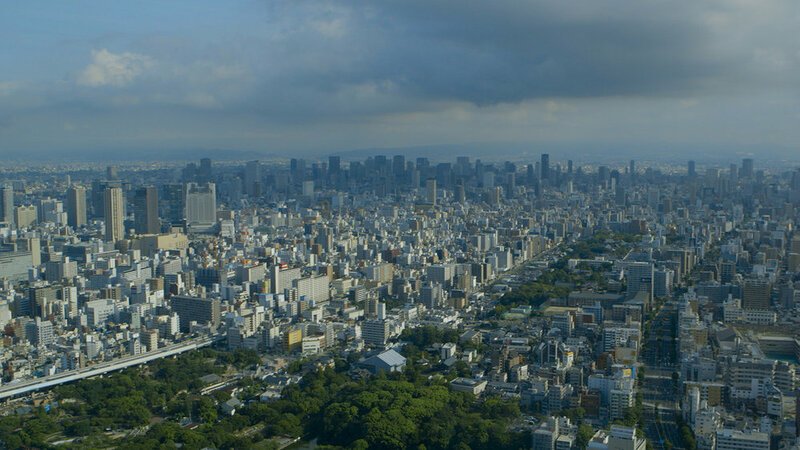 The Osaka, Japan Face to Face event. An old Japanese castle located in Osaka, near the chapel where the Face to Face broadcast was held. The Manilla, Philippines Face to Face. The two teenage hosts take photos with the Stevenson after the Philippines Face to Face. 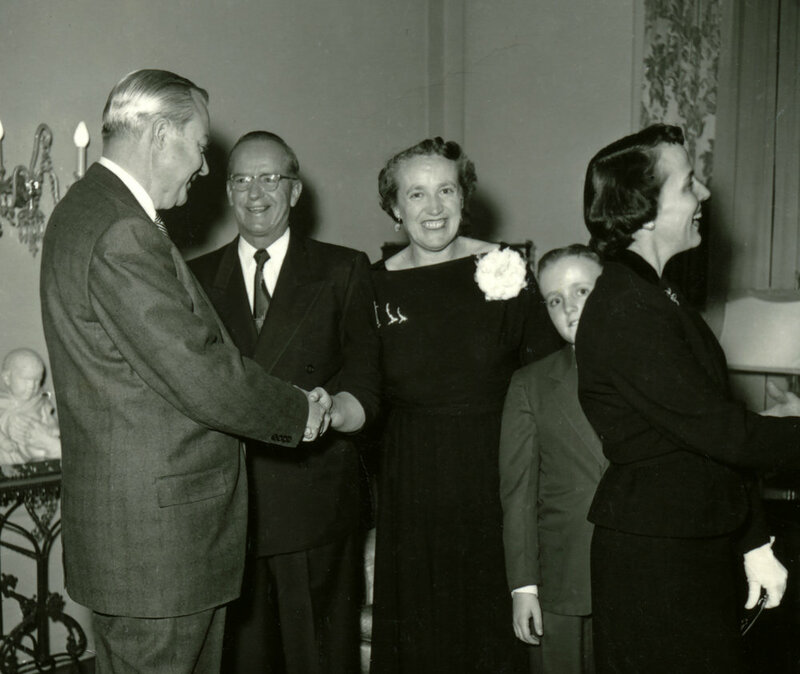 Images and videos courtesy Intellectual Reserve Inc.
Last week I was able to meet Joan Maw, a daughter-in-law of Herbert Maw, Governor of Utah from 1941-49. Governor Maw was the second governor to live in the Governor's Mansion and Joan let me look through a few family scrapbooks at her home in Salt Lake City. While we looked the photos she shared a few fun stories she had heard over the years from her husband and in-laws. While in the Mansion, oldest daughter La Rue complained to her father that none of her friends dared swing by the house to pick her up. Her parents tried to compensate for their fame by hosting parties for their children and keeping an open door policy for friends. One day five year old Ralph decided to explore the home’s steep roof, “Just to see if I could do it,” he later recalled. But he soon found himself stuck three and a half stories in the air until the governor himself came on to the roof to rescue him. Here are a few of the photos from the Maw family scrapbooks. They will be used a in a documentary I am producing for PBS station KUED7 on the Utah Governor's Mansion. One unique event that happened at the Mansion during the Maw years was a wedding. 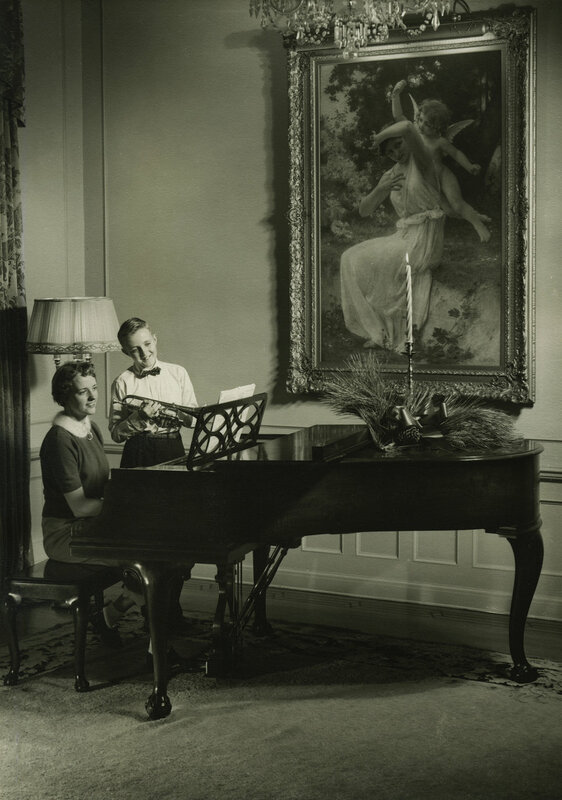 Each Governor family enjoyed hosting formal birthday parties for their children in the Mansion's dinning room. An example of the Maw's "open door policy." Images courtesy Joan Maw and the Utah State Historical Society. I recently had the opportunity to interview Jon Lee Taylor, a daughter of J. Bracken Lee who served as governor of Utah from 1949-1957. In our interview Jon shared her memories of living in the Governor's Mansion in Salt Lake City - a big change from the town of Price she grew up in. While living at the Mansion, Jon attended West High School. On several occasions she and her mother hosted "Teas." 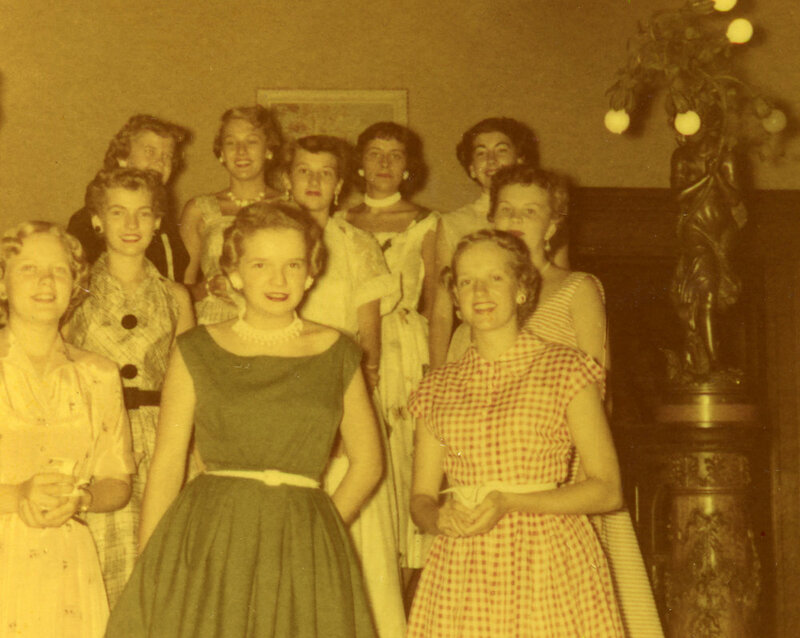 All the girls from West High School were invited to the Mansion for a tour and refreshments. Here are a few photographs Jon shared with me from her scrapbook that show her family's time in the Governor's Mansion. Images courtesy Utah State Historical Society, Jon Lee Taylor, Salt Lake Tribune.